I love going to the beach. I love that we are only 40km away from the beach. Even though I don’t drive, it is only a $3 bus ride away. The beach makes me happy, it makes me feel centred and peaceful. Paul and I try to regularly take Mr 4 to the beach. It’s a cheap way to spend the day and it has the added bonus of tiring the sleep dodger out! 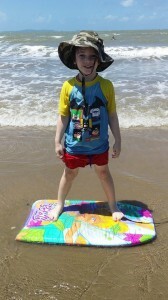 I love watching Mr 4 run through the waves and laughing when one crashes over him. Sometimes we get fish and chips, spread out the paper on the ground and enjoy lunch while we watch the water. Our favourite fish and chip shop shut down last year and so we haven’t done that in a while which is a shame. We usually get Maccas on the way home, but it’s just not the same. We’ve taken our own food in eskys before but it was always a pain trying to lug it down onto the beach. Especially if we are going fishing too, an esky for the bait and an esky for the food meant multiple trips to the car and it often looked like we were moving to the beach for a week not just the day! 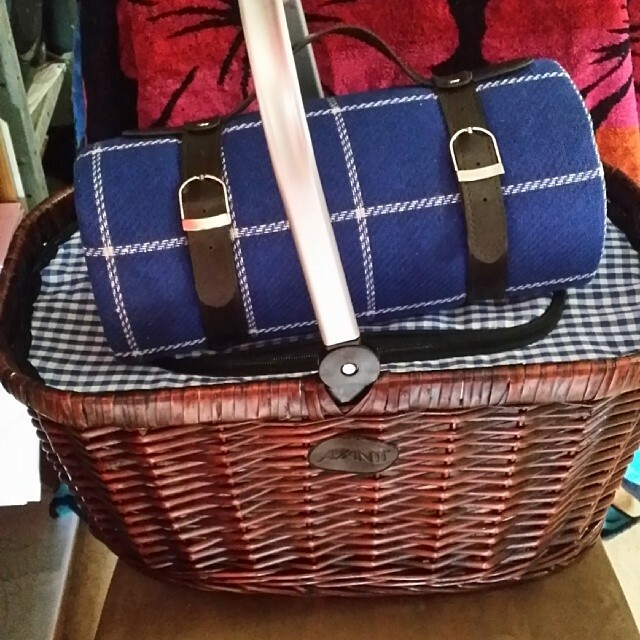 The awesome people from Pepsi sent me a picnic pack including a gorgeous picnic basket and blanket that solved the dramas perfectly. Not only did we get the gorgeous picnic basket and blanket but we also got cans of the new Pepsi Next to try out. Pepsi Next is boasting that they are the next generation of cola, being the first of it’s kind in Australia to use Stevia as a natural sweetener. Pepsi Next has 30% less sugar but boasts that it still has the great taste of a full sugar cola. I have to admit that I’m not a fan of Pepsi. So I was a little wary of how Pepsi Next was going to taste and if I would like it. 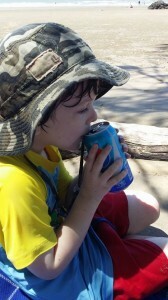 Mr 4 was itching to try out the new ‘beer’ and had been pestering me for one since the package arrived on our doorsteps! I was actually pleasantly surprised about the taste of Pepsi Next. I was a little wary of the low sugar as I have found most low sugar/no sugar drinks have a bit of a nasty after taste. I was glad to find that Pepsi Next didn’t. It had a nice crisp, refreshing taste that I thought was completely different to anything I have tried before. Mr 4 loved it and Paul was surprised at the nice taste as well. To sweeten the deal I also have 8 cans of Pepsi Next to giveaway to one lucky reader! The winner will be judged on creativity so make it as yummy as possible! Entries close next Tuesday the 11th of March so get your answers in quick! The competition begins on Tuesday the 4th day of March 2014 and closes at midnight on the 11th day of February 2014. The winner has 48 hours after being contacted by email to answer, or the prize will be redrawn. Entrants must answer the question ‘What is your favourite picnic food’ in order to be eligible to win the prize. Each entrant is only eligible to win one (1) Pepsi Next 8 pack. This entry was posted in Reviews/Sponsored/Giveaways and tagged IBOT, product review on March 4, 2014 by Tegan. How nice is that little picnic basket?! You are so lucky to live so close to the beach. We are only an hour away, but still it would be nice to be closer. My favourite picnic food is chips and dip. Not very creative sorry, but I can’t have a picnic without them. There’s something about water, isn’t there? It’s so calming. and joy inducing. I have a friend who used to be a caterer – she always makes the best picnic food. Ours is just chicken and purchased salads – still the best because I don’t have to do any work. I get the thing about the beach Tegan, I couldn’t live far from the water. Favourite picnic food is boiled egg sangers. It’s what we always ate as kids, and it doesn’t feel like a picnic without them. I love Pepsi and have been using Stevia as a sweetener for a year or so now. Unfortunately I cannot drink pepsi any more (one of my fabulous intolerances). Oh well, in the past I may have kept Pepsi in business after they came out with diet pepsi. It was a staple for me! I love living near the beach, not as close as I used to but 10minute drive and we are there! I love picnics and fill our basket with roast chicken sandwiches, frozen juice poppas and my families favourite is caramel slice! What a great picnic basket! I’m not a fan of Pepsi either and I always go with full leaded so would be interested to taste Pepsi Next. I love egg and lettuce sandwiches when I go on picnics. Leftover cold pizza is awesome at the beach and Pepsi Next would make it taste even better. On picnics, I love to take little triangles of filo pastry filled with spinach and feta cheese. They are yummy cold, so are an ideal picnic food. I also love taking homemade bacon and cheese rolls, fresh salads, cucumber sticks, and for dessert either mini cinammon-glazed muffins or chocolate cake. I liked Pepsi before it was cool! Back when it was harder to find, especially cold, not many places had it back in the early 90s! My favourite picnic food is Fish and Chips, less work for me! We always buy a big bottle of drink and take paper cups, we don’t have a car so the less stuff to carry the better! How extremely lucky is your family…picnics at the beach!! We do quite a few picnics through out the year, we religiously do one on Australia Day some where special each year… Our favourite spot in Apsley Falls, Walcha. We love to take salad, meat, fruit salad & normally a treat for the kids of mud cake muffins….Yummo!! Chocolate cake is the best thing on a picnic. We always scoff down our sangas as quick as possible, because we always have a chocolate cake for afters, and it is the best thing ever after running around. Mini frittatas with turkey, cranberry, swiss cheese with slivered almonds would be on the top of my picnic hamper list, followed by mini gourmet hot dogs for my girls. We only live 2 minutes drive from the beach, you can see the water from our house and have started taking it for granted. We were in the habit of walking to the beach (20 minutes) just us girls and we would have hubby drive down with the bbq meat or picnic hamper depending on how windy and what bbq’s etc. were available. Must start doing that again. My favourite picnic food is egg salad sangas with spring onion. They stink to high even but when they’re really cold and really fresh they taste really good. I love taking supermarket packed pasta salad. The only time I ever buy it is when we are on a picnic. My little girls get excited everytime I buy it because they know a great adventure is not far away! Muffuletta, , a loaf cut horizontally and filled with layers of marinated olives, salad and meats etc, then wrapped in cling film over night and weighted down so it compresses and becomes one big chunk of yum. Delicious at a picnic. A big french stick filled with salami, tomato’s and cucumbers and lots of freshly ground pepper. Always a sucker for cookies at a picnic but love cheese and tomato on crackers. Zucchini & Bacon slice. Tasty, health and easy to eat.